Newsquest-owned The Northern Echo has announced the revival of a newspaper last published in 1986. 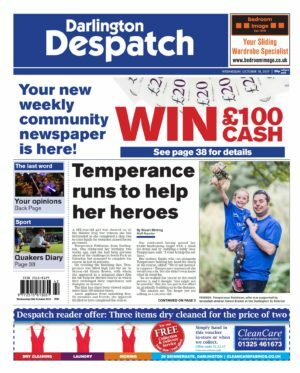 The Despatch will be relaunched tomorrow as a “part-paid, part-free” weekly in Darlington and towns across south west Durham, including Bishop Auckland, Spennymoor, Newton Aycliffe and Willington. The title had run as a daily before being withdrawn in April 1986. Editor Andy Richardson said: "In their heyday free papers were the go-to place for advertisers looking to connect with a local audience. But the days when a copy of the Advertiser was posted through every letterbox in the area has become a thing of the past - the numbers simply do not add up. "Businesses wishing to promote their goods and services to local people are turning to a wide range of media, with digital and online platforms increasingly important, and newspapers are only part of the mix." The Despatch will be delivered free to about 10,000 homes, and will be available from retailers for 30p. "Readers and advertisers tell us that they still value good quality newspapers and that is why we have launched the new Despatch," added Richardson. "It is a bright, modern-looking newspaper packed with news, views, and pictures. It will be very community-focussed, so this will be chance to feature local events, from fundraisers to fun-runs, as well as give local people a platform to share their views, and showcase success stories from schools, businesses and sports clubs in the area."